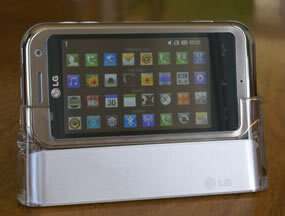 The LG Arena is undeniably an attempt for LG to tackle those who would be tempted by the Apple’s iPhone. It’s smaller than either of the 2G or 3G iPhones, slipping easily into the back pocket, with a feel of quality about it. It feels solid and reliable. The hard polished metal front edging is complemented by the light, aluminum back. 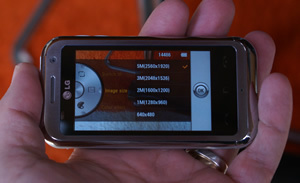 The whole interface of the phone is touch screen, beyond the power, photo and volume buttons. The considerable experience that LG has built up with touch interfaces from each of their previous models show with improved quality and responsiveness. The Homescreen allows you to side swish your finger across the screen to progress right and left to the next screen of icons. This can also be achieved by putting it in spinning-cube-mode (see the video for demo) – differentiating it from the iPhone. It’s fancy and will impress mates, but it’s not really clear what the advantage of it is beyond that. As is essential with phones these days, the media player is good quality with the music playback through the built-in speaker, via Dolby Mobile, producing impressive high end quality, while obviously missing bass tones. Animated background for the media player are also selectable. 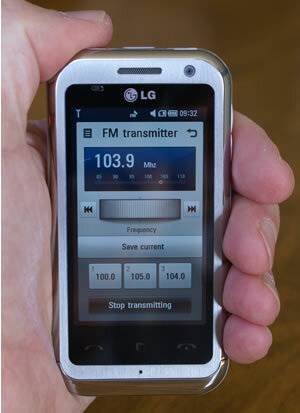 If you’re after higher quality reproduction to share beyond your own headphone, the LG Arena also has FM Transmission built in to the handset, a feature you have to buy an external plug-in device for on the iPhone. 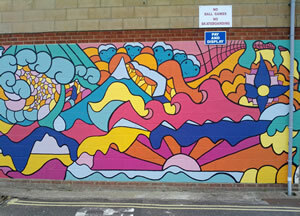 It works, but we found it was limited to about half a metre range, probably to comply to UK Ofcom restrictions. The 5 Mpx camera gives really good results, another thing that LG has been consistently strong on over the last few handset since the LG Viewty. Selecting options bring up a really nifty interface with a rotating dial on a ‘real’ camera. 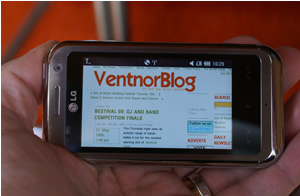 The LG Arena has Wifi built-in making the applications that they provide highly usable. The Web browsing is good quality experience, but the screen zooming was a little slow to refresh. Only wierdness that we found was that you can’t rotate the view of the browser to landscape before the page has downloaded. YouTube video playback looks good on the screen. There is an option to display them on a TV too, but we didn’t have a chance to test with as we didn’t have the leads. For a touch screen device, searching for contacts to call or text is OK, but if you’re used to a full keyboard device like a Blackberry, you might find it a little clunky. We also found the pause, while it loaded its contact, a little annoying. The dock that is provided looks really swish and wouldn’t be out of place on any desk. While the phone is charging and/or exchanging content with your computer, the LG Arena is angled toward you so you can still easily use the device. One of the things that makes the LG Arena look really cool also brings the only real down side. The glass, slightly mirrored front makes it a real challenge to read in bright, direct sunlight. Now, this isn’t always a problem in the UK :) but on the occasions that we were blessed with a bright sunny day, we found we had to shade the handset under jackets to try and see the screen clearly. Summary: LG have produced a quality handset that looks great and works well. They need to tone down the reflective screen though. I like that funky radio dial! LG arena is an excellent phone. Screen is wonderful, very responsive to touch. The only problem is with the divx, since often it doesn’t work. Next Next post: Dl Hulu UK Launch In September?